Hi, I’m Jess and I’m so happy you’re here! Paper Doll Press was born more than a decade ago out of my lifelong love of pretty paper and the thrill of receiving something beautiful in the mail. 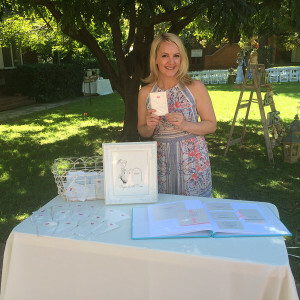 Through the years I have had the special privilege of creating wedding invitations, baby announcements and countless sets of personal stationery for friends and family, and also for many people I have never met. Now that my dream of opening a home studio has come true, I am thrilled to be able to spend even more time working with my clients to create beautiful letterpress pieces that fit their personality, style and budget. Paper Doll Press is located in Pasadena, California, just minutes from Los Angeles. When I’m not in the studio I am a full time mom to two rambunctious boys, and wife to my amazingly talented writer husband, whose super romantic poem over 10 years ago inspired the name Paper Doll Press. 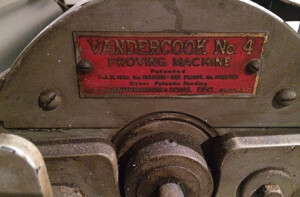 Letterpress Printing is the earliest form of printing, dating back to the 15th century. Today it is considered an art form in its own right. It uses a relief technique in which movable type or computer generated photopolymer plates are used to impress an image onto paper. 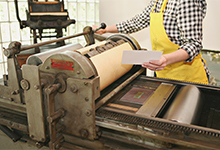 The most high-end form of printing today, letterpress printing is easily recognizable by its tactile and hand-made quality. 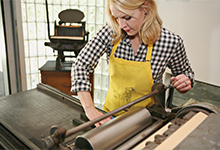 Paper Doll Press offers high quality letterpress printing for graphic designers and invitation shops and can be hired to provide printing support for other letterpress printers. Please contact me for hourly rates and availability. © 2015 Paper Doll Press. All rights reserved.